As I have been preparing myself for 40, I have spent almost a month reflecting on my journey to here. Sure I could talk about all that has happened since Pressing Pause at 39, but it’s more than that. Preparing for 40 has been about reflecting on the overflowing, ever reaching love of God. In every season, He was present. He was in the moving, revealing the masterpiece He placed within me even when my brokenness seemed to scatter me into pieces. Moving beyond the comfortable places, taking me further than I was able to see. Moving through the depths of pain to bring me higher with Him. In every season, He never let me go. He was in the stirring, releasing the grips of fear and pain. Even when I failed to acknowledge him, even when I let Him go time and time again, His love held on. Even in the waiting, His love was restoring, healing and renewing. I only had to be still, to be in the moment completely overwhelmed by the tenacity and gentleness of His love for me. In every season, He had a plan. He was in the leading, preparing in the hidden spaces a life worth experiencing. In the difficult, the beautiful, and even the mundane moments, He kept on guiding my steps. He has been committed to me desiring to see the best He put in me fulfilled even before my existence. My loving God was preparing my heart not just for now, but for the days ahead. Walking into this new decade, I reflected on the decades I have left behind — parts of the journey that have bought me to this place. The parts of the journey I didn’t realize would give purpose in my testimony. The tiresome parts of my journey I thought would surely break me. The parts of my journey that I have walked with some pretty phenomenal people. Through it all, I can BOLDY say it was GOD who bought me here. So, I wasn’t so surprised that one song kept popping up in my spirit—“You’ve been so faithful”. First introduced to me at 20 while I was a member of the gospel choir back in my undergrad days, it’s been years since I have heard this song. Little by little the lyrics kept finding a way into my day. Oh yes! Looking back, I see how Jesus Christ was there all along–loving me, holding on to me, guiding me, because Great is HIS faithfulness. 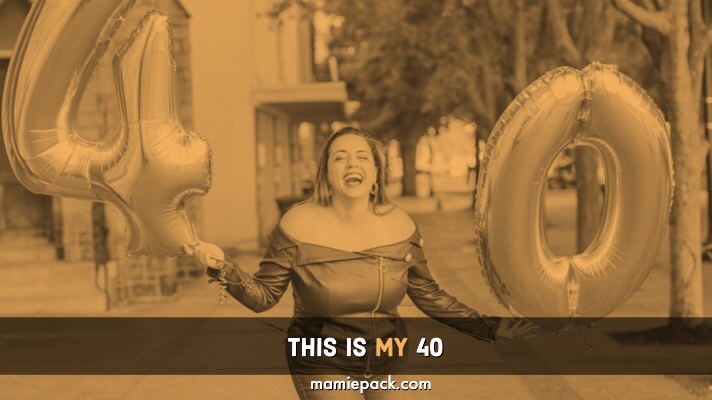 You rock 40, Mamie!!! Big things in store for this new decade!!!! Awwwww! Thanks so much Virginia. Happy birthday! You are one pretty 40 year old woman! I am 41 and I love it! How MUCH I needed this exactly story today…we are in a difficult season, knowing we’ll likely be uprooting again. Thank you so much for this refreshing encouragement! Oh, Christa! Are you a military family? Praying for a smooth transition and favor in your new location. I love looking back and seeing how faithful and tender God was and is to me. Enjoy your 40’s! Happy 40! And where did you get that off-the-shoulder leather jacket??! I love it! Oh, thank you. I bought it from Venus. Thank you Susan! He keeps us at every age and every stage. Yes He is Taylor! That is the best gift on any birthday. Happy 40th! Glad to hear you are doing well and enjoying life. You have such a great attitude and that will get you far! Thank you Flossie! I am looking forward to this new season. The older I become the more I see God’s hand all throughout my life. With Him even my painful moments have purpose. Mamie. I love your story of hope in the journey. Our God is always faithful. Happy birthday. Happy birthday! One of my best friends is turning 40 in two days and I can only pray she can embrace it like you have. Oh, thank you so much Rachel. I hope your friend embraces everything 40 has to offer.